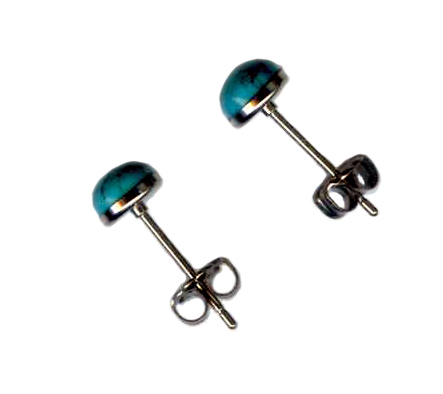 Genuine turquoise cabochons hand set in titanium cup posts (manufactured by Dirinda Patterson). All earrings are made in USA with medical grade 100% titanium -- the best choice for those with allergic reactions to other metals. Dirinda maintains strict quality control on metal composition so it is free from contaminants which are often the cause of allergic reactions. 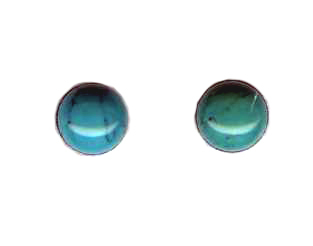 Turquoise cab veining pattern varies from very little to dramatic. Care is taken to match patterns as closely as possible for each pair. Pictures below show a representative pair.